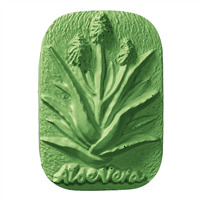 The Aloe Vera Soap Mold features a spikey aloe vera plant with three blossomed flowers and the words ‘Aloe Vera’ written along the bottom. We love using this plastic mold with aloe melt & pour soap bases or with cold process soap made with aloe vera oil or aloe vera powder. 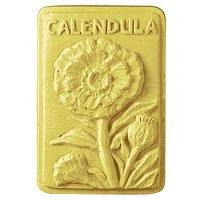 Bar Depth: 1" Bar Length: 3 5/8"
A large calendula flower centers on this rectangular mold cavity with ‘CALENDULA’ written in capital letters above. Calendula is a popular additive in soaps because it has been used medicinally for centuries. Mold soaps with calendula petals or calendula extract in this plastic mold. 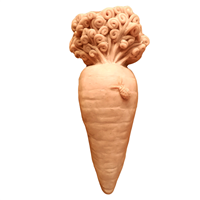 Bar Depth: 1" Bar Length: 3 3/8"
This carrot shaped bar mold looks like it was just picked from the garden! Completely with a little lady bug on the top right corner, this soap mold is perfect for anyone with a green thumb. Also great for Easter. Bar Depth: 1.0" Bar Length: 5.125"
These four seed packet designs are sure to be a hit with gardeners. 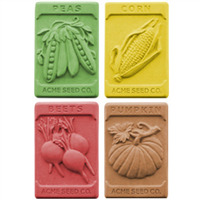 The Garden Seeds Soap Mold features Acme packets of Peas, Corn, Beets, and Pumpkins. 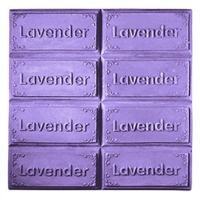 Bar Depth: 0.75" Bar Length: 3.5"
What better way to advertise your soaps are made with lavender than by literally writing that on the bars? The Guest Rounded Lavender Soap Mold has a pleasing, rounded shape and features a sprig of fresh lavender. What better way to advertise your soaps are made with lavender than by literally writing that on the bars? 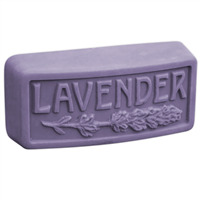 The Lavender Soap Mold Tray is effective and to the point. And with its decorative floral border, it’s pretty, too! 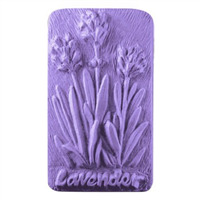 The pretty Lavender Wild Bar Soap Mold features the titular plant itself growing in the garden. Perfect for your homemade lavender soaps. Not only are peas a delightful garden snack, but they also played an important role in the formation of modern genetics! The Austrian monk Gregor Mendel grew over 28,000 pea plants before his epiphany. The adorable Guest Pea Pods Soap Mold is perfect for gardeners, baby showers, and Francis Collins groupies. This Succulent Silicone Soap Mold can be used to create adorable succulent shaped embeds to put on top of soap and bath bombs! This mold has 14 cavities, with 3 different sized succulent shapes. You don't have to have a green thumb to love this succulent soap mold! 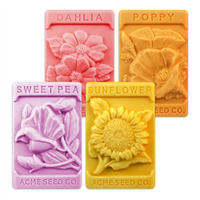 Plant some beauty with the Vintage Flower Seeds Soap Mold. You’ll find packets of sunflower, dahlia, poppy, and sweet pea from the ACME Seed Co. in this charming design. Pair it with the Garden Seeds Soap Mold for a complete garden set! 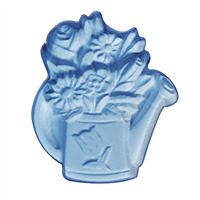 The Watering Can Soap Mold is perfect for all gardeners! It shows a classic watering can overflowing with flourishing flowers!